Low bow and Kookaburra 4-Core technology makes the Team Origin one of the most exciting hockey sticks to review from the Kookaburra 2015 range. It’s not the lowest bow that Kookaburra do, the Team Origin comes fitted with the EXTREME shaft shape which is a 24.5mm curve at 220mm up from the heel and it is a great shape for almost all low bow lovers. Review wise it is a great shape for attackers and will give a great platform from which to control flicks, 3D tricks and intricate dribbling. 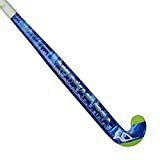 Where we are focusing our review of the two top of the range hockey sticks from Kookaburra in 2015, of which the TEAM ORIGIN is definitely one, is the fantastic 4-Core technology which has seriously increased the power of the stick. These beasts feel stiff, you will be a player that can handle swinging and hitting with a great chunk of carbon around if you buy, or even review to buy the Kookaburra Team Origin. Most elite players will have adapted to high carbon sticks and those looking to make the move up, will also enjoy it. Despite the stiffness of the Team Origin’s 4-Core construction, there is still an element of feel, not much, but Kookaburra sticks I’ve reviewed in the past all have a light touch which is somehow retained in the Team Origin despite all the technology that would suggest you loose that level of control. When you review the technology of the Team Origin you should note a technology called SFR or Soft Feel Resin. This wondrous material is applied to the outer layers of the sticks construction giving a slight cushion on impact. Previously, in my opinion, this has effected power (or at least the feeling of power) in the Kookaburra high carbon sticks. However now the inners of the Team Origin and the other 4-Core sticks are so stiff it contra’s out nicely. You now get the best of both worlds. In my opinion there are better option out there for drag-flick specialists, the Team Origin isn’t for you, the adidas DF24 is the best carbon stick for drag-flicking that I have reviewed. However, hockey isn’t just about drag-flicking. I also love to review any Kookaburra stick for the best reverse hits available. The Team Origin features the special reverse edge reinforcement called EVA and for me as a bad reverse striker I love the forgiveness this feature gives me. The Kookaburra Team origin is the sturdy attacker’s choice of stick. Only available in light weight this stick is designed to be playable. Moving it around is easy and gentle on your arms. I like a stick that knows what it is, the fact the weight choice is limited reinforces that Kookaburra believe it is the right weight for the job, I love that. Too much choice gets in the way sometimes. So all-round, combining an increased carbon content with 4-Core technology Kookaburra are telling you that this stick is light but designed to hit the ball hard, really hard. If you want more control than power check out the Kookaburra TEAM Dragon review because the Origin is all about power, a great stick.